Welcome to my journey on finding the right way to lose weight, dealing with the struggles and difficulties, and finding tranquility. But one thing I read of hers was her life story. About how she fell into a heroin addiction and hit rock bottom. She was in the same place as I feel that I am now. At least with my disorder and health. I feel I am very close to changing my body past the point of 100% recuperation. I don't know if I have diabetes, a heart problem, or a cholesterol problem (I have a doctors appointment scheduled for Jan 2nd, so I will find out soon). Some of these are fixed with a healthy lifestyle, but some aren't and honestly I don't know how many years I have shaved off my life with this, and whether I can get those years back by getting healthy. One thing this blogger said is, as she sat at her rock bottom she wondered when she was going to be rescued? When will someone care enough to come and take her problems away? Well that is how I have felt my entire life. And slowly without realizing it, I have rescued myself bit by bit. Reading her blog I realize now that the champion I have been looking for to fight my battles has been within me this entire time. I AM strong enough to do this, I CAN change my life, and I WILL make sure that when I come out of this on the other end I will appreciate my worthiness to live a happy and full life. The only thing that has stood in my way since I made that realization was trying to convince myself that I was worthy enough to be rescued. And then I came across this picture. 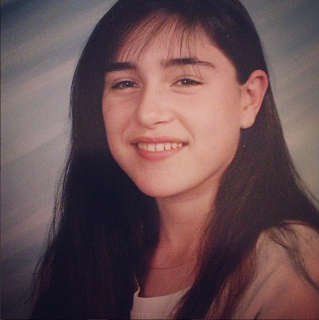 This is me at 12 years old (and yes I did Instagram this picture :p LOL). Look at how pretty this girl is, how innocent and I know it must sound weird for me to say this of myself, but look at the kindness and positive energy she exudes. I can also see the pain and the insecurity behind the eyes, but that is because I have the same memories of this girl and what she was going through at the time of this picture. But I look at this picture and I find someone worthy to rescue. I will rescue who I am now for this 12 year old girl. She shows the promise of who I could have become, and I will win that back for her and for myself. I am a big believer that we go through things because they shape who we are, and I am pretty darn happy with who I am on the inside, besides all the damage, the anxiety and that neurotic brain I live with. If I look into myself and see my personality, I am so damn proud of that. And this picture of me at 12 reminds me of that personality and how beautiful it truly is. It is flawed but even then, I love the flaws. That is the one part of me I truly love about myself. It's just all the damage that is in there as well that I hate and want to change. And what I went through to get that damage? Well lets just say that I do wish it never happened, it didn't help shape who I am, only took away from who I could have been, and if I had to go through it again, I would never do it. I want to change/remove the parts of my life that feed into that damaged part of me. I deserve to live my life at my full potential and I will not let those factors that try to tear that down do it anymore. I will be that knight in shining armour for myself. travel to Europe (I can barely handle a 5 hour trip in those cramped airplane seats, extra cramped for me, let alone the flights that are double that or more to get to Europe ). dance! I need to dance again, I have this expressive dancer within me and this shameless performer that needs to get out there and move again. I want to do YOGA!! because of my girth there are too many positions that I cannot do, and also right now at the weight that I am, my joints cannot truly support me. So one thing I definitely want to do on a regular basis once I lose weight is yoga. That's all I got for now :) if you have plans to change your life, I challenge you to list at least one incentive, one thing you dream to do, that you can only do once you have met that goal to change your life, in the comment section below. My plan for finding tranquility is to de-clutter my life, and my hubby is right on board with me on this. I am going to get rid of/throw out/donate my clothes, extra plates, extra appliances, etc. I want tables in my house to have nothing or only one thing on them. Very proud that you are rising above the prison of the past and realizing that you are indeed the strong person I always believed you were. Also I am so onboard with de-cluttering, travelling, and even Yoga!!! Best post so far. Beautiful picture! I completely agree with the de-cluttering.. that is something we are working on too! Liking Food Too Much or Something Deeper?